Ladder Golf is played with 2 or more players or teams. Each player has 3 golf ball bolas. A bola is 2 golf balls attached by a nylon rope. The object of the game is to wrap your bolas around the steps of the ladder. The ladder consists of 3 steps, a top, middle and a bottom step. allows for a closer toss line for children’s games. Ladder Golf is played in rounds, each round consists of all players tossing 3 bolas. A coin toss is used to decide which player or team will toss first. The first player must toss all 3 bolas before the next player is able to toss his or her bolas. Bolas can be tossed in anyway the player chooses, as long as they are tossed individually and can be bounced off the ground. The winner of the round earns the first toss in the next round. and the player will enter the next round with 18 points again needing 3 points to win. the end of that round no matter how many points the other players have. Bolas: A Bola consists of 2 golf balls attached together with a piece of nylon rope. Golf Balls are spaced 13” apart. Steps or Rungs: Each ladder has 3 steps. The top step is worth 3 points, the middle 2 and the bottom 1 point. 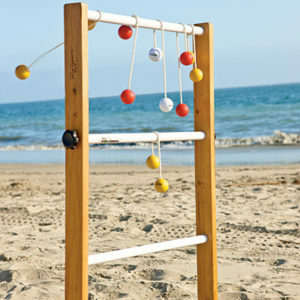 The bolas provided with your new Ladder Golf game are connected using special anchors that, under normal game play, will provide a lifetime of use. DO NOT pull excessively on the bolas (tugof-war) as abuse of the bolas may cause the anchors to pull away from the ball. wood has been sealed, we recommend that the ladder is not left out in the weather.